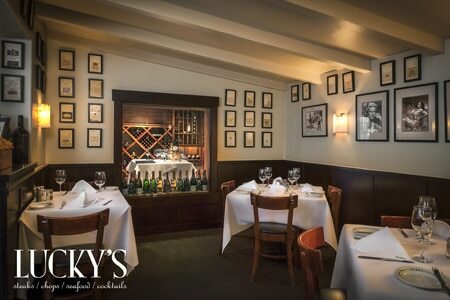 Lucky's is a sophisticated steakhouse with an impressive wine and spirits list. : Lucky's décor is part of its allure. Vast windows peek out on a colorful thoroughfare. Old studio headshots of Hollywood stars on the walls create a palpable classy feel. But it's the quality steaks that have garnered Lucky's a devoted repeat clientele. Cuts like filet mignon, sirloin and New York steak are served à la carte, with a bevy of starch and vegetable options. Lucky's is also famous for offering abalone, brought in from a nearby ocean-water farm, pan-fried and served with a Chardonnay-butter sauce and a rich cucumber-dill salad. There's rack of lamb too, as well as such appetizers as the French onion soup, giant prawn cocktail and rice flour-battered onion rings. Save room for desserts like warm bread pudding with bourbon sauce and a Grand Marnier soufflé with crème anglaise. Lucky's wine list is long and heavy on expensive bottlings. The crowd tends to be big and noisy on the weekend, so be prepared. The weekend brunch is moderately priced and extensive and features outdoor seating.